First off, look at this video of Joe Flacco. Can anyone tell me....is this for real? because if it is, I may go buy a jersey of this guy. That's amazing stuff. 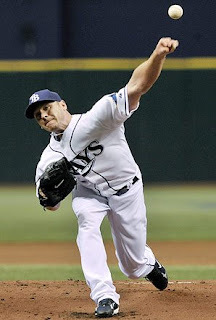 Another thing I'd appreciate some feedback on: what the heck happened to Scott Kazmir? With the Jets starting training camp this week, and there is a distinct possibility that both of the Jets star running backs might hold out due to contract squabbles. The New York Times does a good job breaking down the issues. One caveat: If I were a GM, and anybody referred to themselves in the third person (read the article), I would immediately cut them. I really would. Interesting piece re: the SEC TV deal. In case you hadn't heard, even in this down economy, the SEC negotiated a budget-busting deal with ESPN and CBS, to the tune of (cue Doctor Evil) 3...billion....dollars. And while the other conferences are worried that this huge contract gives the SEC even more of a competitive edge, the writer of this piece, as well as your truly, feel that this just raises the bar, so that when the ACC, Big 12 or whomever goes in to make a TV, they can start from this contract and negotiate from there. And let me just say this again.....3 billion dollars. And in the tooting my own horn section of AAPTBNL, it seems the Yankees are seriously scouting Ian Snell—especially now that Chien-Ming Wang may be out for the rest of the year. As you may recall, last week I wrote that the Yankees should look into picking him up cheaply. Snell has a relatively small contract, is blowing up AAA hitters and could really use a change of scenery. Putting him the locker room next to Derek Jeter, Mariano Rivera and all the other Yankee vets can only help Snell adjust and become something of a steal for the Yanks. A while back I reported that Boston College linebacker Mark Herzlich, aged 21, was diagnosed with cancer. Mark was a first team All-American LB for BC, the ACC Defensive Player of the Year, was a finalist for the Butkus Award and was a projected first round draft in next year's draft. Well good news on the Herzlich front. Apparently, the chemo treatment has caused the tumor to leave the muscle tissue and surgery is not required. As Herzlich said when he announced that he had cancer, let's hope he beats this and can play the game he loves again. Enough ESPN with the Michael Vick coverage. he wasn't a good QB before the two year layoff (53.8 percentage completion rating lifetime; Matt Ryan, in his rookie year had a 61.1 rating), what makes anyone think he can quarterback any better now? And as for Mike Florio's article that Mike Vick is right now, one of the best 32 quarterbacks in the league, I'd say he might not have been one of the best 32 when he last was in the league. In 2006. When he had a 52.6 completion rating, a 6.4 Y/A and averaged a measly 154.6 yards a game through the air. Those weren't pretty numbers then, and they shouldn't be any better now. Another thing ESPN: Enough with the Tim Tebow stuff. "Oh my god, a SEC coach didn't vote Tebow as best QB in the SEC." Like, wow. I mean, the way ESPN breathlessly covered this "story", you'd think Tebow can fly t o Mars in 8 seconds, shoot lasers out of his eyes and is impervious to cold. "How can someone pick another QB as the best in the SEC?" Good Lord people, who cares about this soap opera stuff? Can we get some actual sports analysis please? 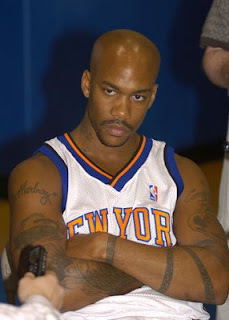 Has anyone caught the bizarre 24-hour Marbury-cam marathon. I hadn't even heard about it until I read this article. Sounds like a train wreck. Makes me sad....what a waste of talent. And lastly, I'd like to give a shout out to a new blog I found. The Pinstriper. I put it on my links on the side because I liked his stuff. Go and give it a read. In no way will I defend Vick and his behavior. I also would say his QB skills or potential never was realized. As a QB for a team, say one of the 32 teams in the league, he could be better than what they got. I understand the completion % and ratings but the guy can/could run. Time will tell what he has lost. I think his problems and attitude in the past shows why his potential was never reached. He never worked on his game like Matt Ryan, like others. He has skill, never had the head in the right place though. Never had quality receivers other than Crumpler at TE either. Re: the Flacco video, the cynic (or is that realist?) in me tells me it is faked. Sounds like good news for Mark Herzlich. And Tebow, who gives a crap? I'm not real big on most sports awards, and I have no time or interest in pre-season awards. Hey guys, yeah that Flacco video is ridiculous. I have to find out if it was reall. And I know I'm a little irrational on Vick, but I never liked his game. I just never felt you could win big games with him. Sorta like Pennington this year. They gimmicked him and protected him and he put up sick numbers. But when came time to play with the big boys, he got killed. And Vick has the same wide receivers that Ryan had last year. As for the Marbury show, how does one go about eating Vaseline? Like Shaq said, it wasn't strawberry flavored. I feel genuinely worried for the guy.